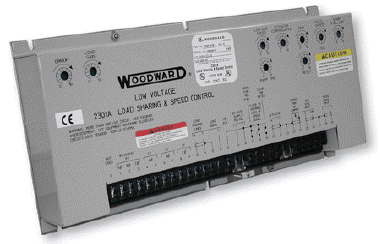 Woodward’s 2301A Load Sharing and Speed Control with temperature Limiting or Process Limiting is used in electric generator systems for which load sharing is desired. It can be used with diesel or gas engines, or steam or gas turbines, and is compatible with all Woodward electronic controls. Rugged construction has been designed into the 2301A control for high reliability in adverse environments. Models for process limiting accept a 4–20 mA or 1–5 Vdc control signal. Models for temperature limiting accept a signal from a Type K thermocouple. Temperature Limiting and Process Limiting controls are available for either low voltage or high voltage supply. Control of speed and load sharing requires, in addition to a 2301A control, a speedsensing device, an actuator, an external power source, and a means of sensing voltage and current. These components make up a basic 2301A system. Additional devices such as Speed and Phase Matching Synchronizers, Import/Export controls, and Generator Loading Controls may be added. • A wide dynamic adjustment range to accommodate a variety of prime movers, including diesel or gas engines, or steam or gas turbines. • Protection from electromagnetic and radio frequency interference. • An internal, isolated power supply for improved noise immunity and ground-loop protection. • Low-voltage model: Once powered at 15 volts or above, the control will operate with a supply voltage as low as 9.6 volts and as high as 77 volts for up to five minutes, or 120 volts for 1/10 of a second without damage and with negligible control transients. Normal power is 20–45 Vdc. • High -voltage model: The control will operate with a supply voltage as low as 75 Vdc (60 Vac) and as high as 200 Vdc (140 Vac) for up to five minutes, or 300 Vdc (212 Vas) for 1/10 second without damage, and with negligible control transients. Normal power is 90–150 Vdc or 88–132 Vac.